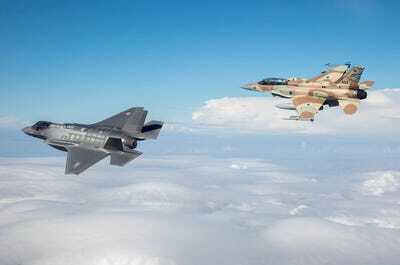 Major Ofer, Israeli Air Force רס’ן עופר, חיל האוויר הישראליAn Israeli Air Force F-35I flies along an F-16I. Israel lost an F-16 to surface-to-air missiles in an intense air war over Syria, but it has operational F-35 stealth jets specifically designed to defeat air defences, begging the question: Why not send the F-35s? The F-35 awaits some software updates to bring it to full combat capability, but an F-35 pilot told Business Insider it’s up for the job, and it’s just a matter of time before it starts. A source with inside knowledge of the F-35 program suggested to Business Insider that if unexplained strikes start happening, we’ll know the reason why. Israel shot down an Iranian drone with an Apache helicopter and had one of its own F-16s downed by Syrian air defences in an intense air battle that played out over the weekend. Experts say its a matter of time until the F-35 steps in for its first taste of combat. After the loss of the F-16, Israeli jets scrambled within hours and took out half of Syria’s air defence network, according to their own assessment. Despite the downed F-16 and Syria’s threats, Israeli Prime Minister Benjamin Netanyahu vowed to continue to wield his air force against Iranian-backed targets in Syria when he feels they get too close to his borders.”We made unequivocally clear to everyone that our modus operandi has not changed one bit,” he said. So why didn’t Israel send F-35 stealth jets? Isreal has spent hundreds of millions on acquiring and supporting the weapons system purpose-built to fight in contested air spaces undetected. Israel declared its F-35s operational in December, 2017. Looks like a job for the F-35? Justin Bronk, a combat aviation expert at the Royal United Services Institute, told Business Insider that the F-35 today has a “very immature software set,” and that it “doesn’t make a huge amount of sense to use them and risk them over enemy airspace” when it can afford so few of them. But retired US Marine Corps Lt. Col. David Berke, a former F-35 squadron commander, thought differently. “I’d be very comfortable flying the currently fielded software in combat,” Berke, who trained with Israeli pilots at the US Navy’s Top Gun school, told Business Insider. “The F-35 will see combat for Israel and it’s just a matter of time,” Berke said. Bronk and other experts contacted by Business Insider agreed that the F-35’s first combat will likely take place in Israeli service, as they lash out against mounting Iranian power in the region. Presently, it’s not clear that Israel didn’t use the F-35. Israel has a long history of pioneering weapons systems and hitting the ground running with new ones. Israel has conducted its air war in Syria very quietly, only publicly acknowledging strikes after its F-16 went down. In March 2017, a French journalist cited French intel reports allegedly saying the F-35 may have already been put to work in Israeli service. Russian Defence Ministry Press ServiceA Pantsir-S1 (foreground) and an S-400 (background) at a Russian Military base in Syria, December, 16, 2015. 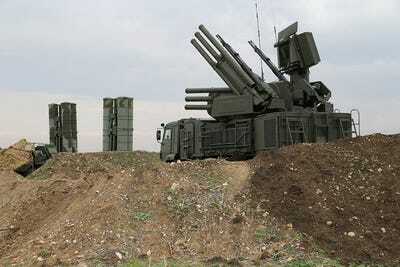 But, with or without the F-35, Israel seemed satisfied with its counter attack on Syrian defences. Bronk cautioned that Israel’s claim to have taken out half of the defences probably only refers to half of the defences in immediate proximity to its borders, but said they have “many, many tricks developed over decades” for the suppression of enemy air defences. The surface-to-air missiles in Syria’s hands “certainly cannot be ignored or taken too lightly,” according to Berke, and pose a “legitimate threat” to legacy aircraft like Israel’s F-16.